There are many things to enjoy about June: the longer days with the sun shining almost until 8 p.m. (at least here in San Diego), warmer weather (but not too hot that it makes me miserable) and a bounty of fresh produce everywhere. This includes one of my favorites, strawberries. While it’s perfectly fine (and delicious) to eat strawberries as-is, in pastry-form, folded into ice cream or in a host of other sweet sides, I like to incorporate them in slightly savory appetizers like strawberry bruschetta. 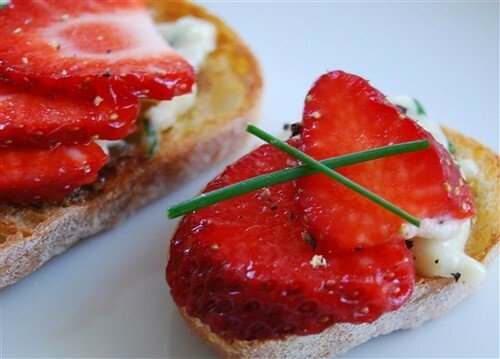 This recipe uses fresh strawberries, gorgonzola cheese, chives and balsamic vinegar on top of crispy French bread slices. The flavor of the sweet strawberries is a nice contrast to the creamy and slightly tart cheese and vinegar. In a small bowl, combine olive oil and vinegar. Lightly brush oil mixture on one side of bread. Sprinkle with a little salt and place on ungreased baking sheet. Broil 4-6″ from heat for 1-2 minutes or until lightly toasted. Remove from oven and set aside. In medium bowl, combine cheese, 2 tablespoons of chives and mix until combined. Spread toasted bread with cheese mixture. Arrange sliced strawberries on top. 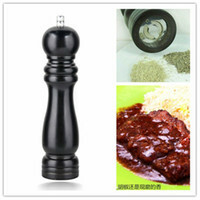 Sprinkle with remaining chive and top with a bit of freshly ground pepper. What a beautiful photo and I love how unique this recipe is! I will definitely make this before strawberry season is over. If you love strawberries, I’m sure you’ll love this. Looks so yummy! I recently had a strawberry, brie & cream cheese grilled sandwich from Devilicious (they called it a strawberry cheesecake sandwich) – I thought it was a fun twist on how to serve strawberries! This also looks excellent – I’d also try it with brie here. I love brie and the thought of brie AND strawberries sounds excellent.